The inspiration for the Balancing Egg is found in cultures where the ability to carry and transport items on one's head is developed. This is a unique product, which heightens children's awareness of their posture and at the same time stimulates their balancing skills. 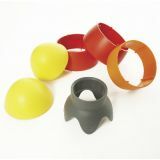 The Balancing Egg consists of a special ring of soft rubber, which adapts itself to the head of each child. The rubber ring is a stable base to build on. In total, 5 plastic parts can be stacked on top of each other to form a 'jar'. Small children can start by balancing 1 or 2 plastic parts before they are able to carry the whole 'jar'. The balancing skill can be increased by putting things in the 'jar' or by competing in a race! For ages 4 and up. Provides endless hours of fun with many different uses! Use as crawl-inside treadmill, fill it with balls and make it a ball pit, or use it as a moving target. 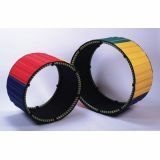 Hoops easily attach to high density nylon covered foam padding with hook and loop fasteners. Easily disassembled into three pieces. Available in two sizes. A wonderful giant top for hours of fun. Use it to rock from side to side, spin it, build a den, etc. Small children can even use it as a boat in the pool (only under adult supervision). Develops children's physical coordination while they play. 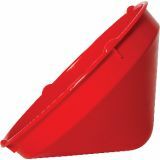 Made of strong plastic for both indoor and outdoor play. Very suitable for basic physical coordination training with disabled children. Raised edges prevent fingers from getting caught. Ideal for 1 or 2 children, grades PreK-5. Oversized shipping charges for UPS will apply. Ages 3-10. The only hoop sacks with double handles! 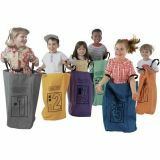 Each sack features lower handles on the inside for smaller children and higher handles on the outside for taller individuals. Constructed of super-strong double-stitched nylon. Summer skis look easy to use but it can be difficult to keep in step. The skis train basic motor functions as the children must coordinate their movements. Made of wood and an anti-skid rubber piece which protects the floor when used indoors. Lots of fun for 2 or 3 children.